My dog has to have surgery, and I don't want him to hurt. How will my veterinarian keep my dog from feeling pain associated with the surgery? 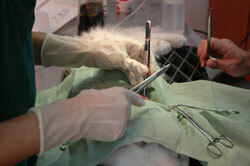 Few events are more frightening for a pet parent than a surgery. Although an operation may sometimes be unavoidable, fortunately our understanding of pet pain - how it occurs, how it affects all body systems, how to prevent it, and how to treat it - has improved dramatically over the past 5 to 10 years. Your veterinarian will begin managing your pet's pain before the procedure even starts. This is called "preemptive" pain management-that is, anticipating pain and providing medication ahead of time to reduce its impact. Therefore, before anesthesia, your dog will receive an injection of pain medication. The medication will travel through the bloodstream to all parts of the body, providing generalized protection and setting the stage for your dog's nervous system to be protected from the pain of the surgery. It is important to anticipate pain and provide medication ahead of time to reduce its impact. What else will my veterinarian do to protect my dog from surgical pain? Once your dog is under general anesthesia, your veterinarian will inject local anesthesia (sometimes referred to as "freezing") around the site of the planned incision to prevent pain signals from reaching the central nervous system. Depending on the nature of the surgery, your veterinarian may choose additional pain management strategies, such as an epidural. Epidural anesthesia involves injection of medication into the space around the spinal cord to provide potent pain relief, similar to what some women have during childbirth. Another pain management strategy that your veterinarian may use during surgery is called "continuous rate infusion" (CRI), which involves the continuous intravenous flow of very small doses of potent pain medications. Besides treating pain, CRI reduces the need for gas anesthesia so that a lower concentration can be used. A lower concentration of gas anesthesia means your pet will wake up faster and have fewer lingering effects. CRI, because it is delivered with intravenous fluids, can continue after the surgery throughout recovery. What about my dog's pain after the surgery is over? Unless they are receiving CRI medications, most dogs receive an injection of a narcotic pain reliever immediately after surgery. They also generally receive a dose of nonsteroidal anti-inflammatory drug (NSAID) to decrease both pain and inflammation. Your veterinarian will determine precisely which medications should be given and at what doses; the choice will depend on the particular surgery as well as the specific needs of the patient. Some postoperative canine patients may also receive physical medicine modalities to reduce pain and inflammation. These modalities may include cold therapy (ice packs), therapeutic laser, acupuncture, and/or massage. Each surgical patient is unique, so each pain management strategy is fine-tuned to meet the needs of the individual dog. The goal is to keep your dog as comfortable as possible before, during, and after surgery. Will my dog come home with pain medication? Any time a dog undergoes a surgical procedure, there is trauma to the tissues, and pain relief is a critical element of the healing process. Which specific medications will be used for at-home aftercare will depend on the nature of the surgery and the decision of your veterinarian. In general, an NSAID will provide the cornerstone of at-home postoperative care, and other medications may be added. Your veterinarian's goal is to keep your dog as comfortable as possible before, during, and after surgery. Good pain relief speeds healing and minimizes any unpleasantness your dog might experience. Do not be afraid to ask your veterinarian for specific details about your dog's pain management plan following surgery.